“The interests of this place were first managed by the Conewago Canal Company, composed of intelligent and wealthy men, mostly from the city of Philadelphia. The 1810 land purchased was a tract of 151 acres, a tract of 64 5/8 acres called “Hopewell,” and another tract of 12 acres, projecting into the river called “Cape Francis.” … The town of York Haven was laid out in 1814 when a neatly designed plan was prepared under the direction of the York Haven Company. There were two sections: the “upper town” was located on the hill and the “lower town” was down by the canal. 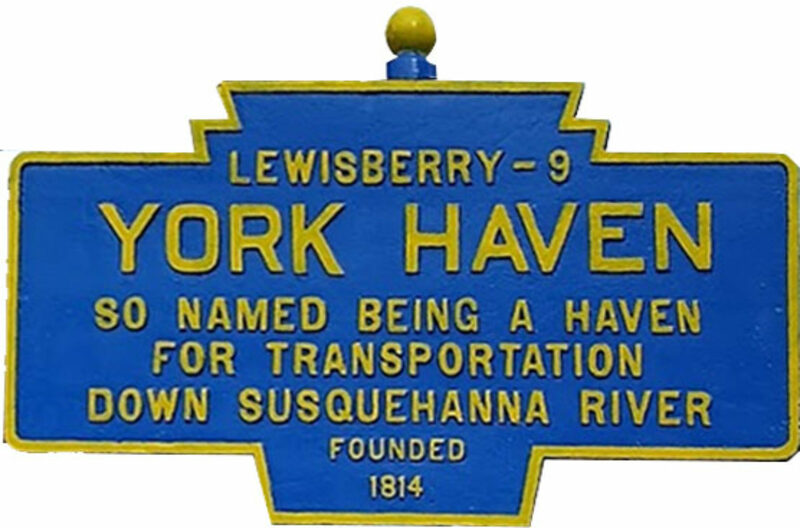 Before the railroads, the river canal was the subject of great public interest and York Haven was to become an important town and business center…. The interest at once began to loom up. Three new mills were built, one having a capacity of 150 barrels of flour a day; for that time this mill had the largest capacity of any in the State. [It is reported that the York Haven Grist Mills contained five pairs of 7-feet Burr Stones. One of the mills burnt in 1826 and the others were for rent in 1832. Cooper shops, hotels and private residences were soon built. Old time fairs were held there with great hilarity. The Water’s Hotel was a very creditable building. The love of gambling became a mania…. Gen. LaFayette, when, on his way to Harrisburg, in January, 1825, stopped there for a short time. The Canal Road to Abbottstown was opened about 1814.” The borough was incorporated in 1892 using the company name York Haven (being a haven for transportation down the Susquehanna River) . The York Haven Paper Company purchased the site of the flouring mills, which had been destroyed by fire and built great paper mills in 1880. This as one of the largest paper mills in the state with 250 employees. The Conewago Bag Manufacturing Company was a part of the Paper Company with 30 employees. By 1899, it had grown to become the sixth largest factory employer in all of York County. The York Haven Paper Company extracted 2,100-horsepower of hydropower, from the fall of the river water, to operate their paper mill. At the time it was built, the York Haven Paper Company was the largest ground pulp paper mill in the United States. Between 1885 and 1895 the biggest customer for their news print was the New York Herald Tribune. The Conewago Canal, enabled late 18th and early 19th century river craft to safely bypass rapids at Conewago Falls. Work on the canal of less than 1 mile began in 1793 and was completed in 1797. Two lift locks overcame 19 feet of elevation between the ends of the canal, and a guard lock blocked unwanted water, particularly during floods. Cargo could go upstream as well as down. A boat going upriver could navigate the canal in 37 minutes compared to the whole day it would take 30 or 40 men to pull it upriver along the bank. That canal was one of the earliest canals in America and it was the first working canal in the Commonwealth of Pennsylvania. The cost was over five times of the initial estimates. In 1825, the Pennsylvania legislature established the Board of Canal Commissioners to oversee the construction and maintenance of the state’s canal system. About 200 men widen the canal in 1885. By 1901, nearly all the commonwealth’s canals were shut down because the railroad system became the main transplantation of people and freight. Parts of the canal locks are display by B.R. Howard Conservation Historic Preservation. For more information and links, visit North Eastern York County History In Preservation.